Karen wanted to redesign two rings that she had inherited. 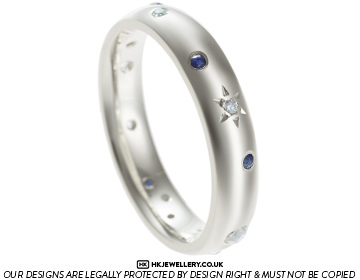 We came up with this design to combine all of the stones in a scatter set design, and to use her old yellow gold mixed with 9ct white gold to make the gold paler. 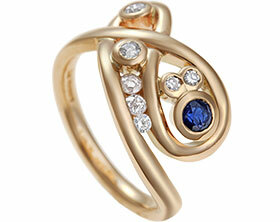 The ring holds a ~2.7mm and two 2.5mm round cut diamonds, two 2mm blue sapphires, four 1.5mm blue sapphires and five 1.5mm diamonds, two of which are star grain set and the rest of the stones are invisibly set. 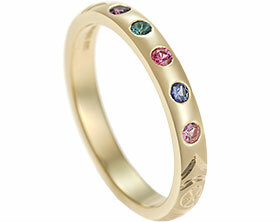 The ring has a courting profile and a polished finish.